Deep cherry red and attractive, brilliant. Leather, tabbaco and spiced nose mingling with red mature fruits. Palate is medium +, velvety, balanced and well rounded. 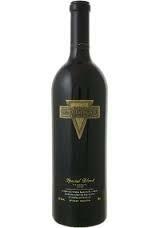 Hints of anise and chocolate hit you on there way to powerful but round tannins and a long finish. Excellent blend !